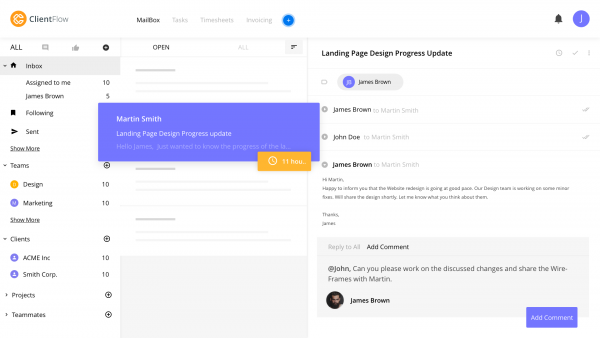 The primary problem with project management is the disconnect between conversations and tasks — and ClientFlow is created to figure it out seamlessly. The future of project management lies in making use of a synergy between communication and work. This will transform the way in which internal and client work is done. ClientFlow sees companies consolidating all their work on a single platform to increase productivity and organization. To remain productive and able to provide impressive customer service, it is crucial that all collaboration among your team members flow seamlessly. Maintaining this level of efficiency can be tremendously laborious. Therefore, the project management tools you use need to be current, streamlined and effective to produce the results you need to remain ahead of your competition. Project Collaboration. Team members receive different ways to collaborate on projects, share documents, timelines, and status updates among other essential collaboration needs. Task Delegation. Project managers can easily delegate project tasks while maintaining a record of which part of the project each team member is responsible for. Remain on schedule. Team members and project managers can track the progression of the project as it advances toward its deadline for completion and they can make any necessary adjustments along the way. 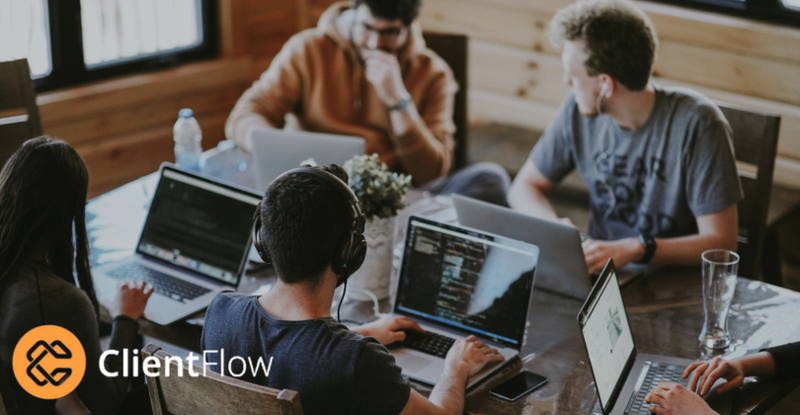 ClientFlow is a project management solution which, among several other project management tasks, allows you to optimize the level of collaboration and communication between your clients and all your team members. It helps to manage all aspects of your project by providing a seamless flow of activity within your project. 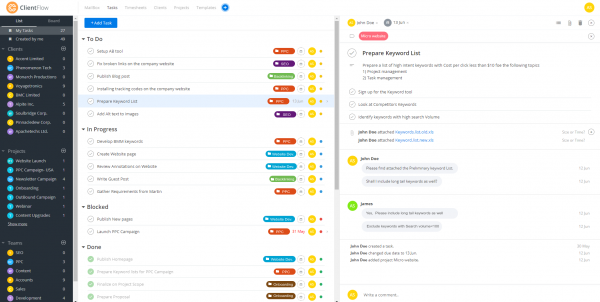 Created by Report Garden, ClientFlow is a client management solution that enables teams to collaborate and control client communications via Shared Inbox, manage client projects and track time on a single platform. All personal and group email accounts such as info@, support@ etc. can be connected so that users can operate out a single platform for all email communications. With shared inbox, all client communication can be organised on one platform and shared with teammates so they can collaborate by assigning conversations to a specific teammate, adding internal comments, following conversations etc. Teams can also send custom branded standardized approval requests to clients to have all approvals on the record. ClientFlow provides all features of a task management software such as assigning, setting due dates, adding internal comments, etc. With all conversations and tasks on a single platform, you can ensure that you have complete context and can completely focus on client service. Email Collaboration. Rather than the need to create an additional email account for your specific project, ClientFlow allows your clients to implement all their actions right from the convenience of their email account. With the shared email platform from ClientFlow, you can do so much more than you otherwise would be able to do with your standard email account alone. You can manage communications with both, your team members and your clients with ease and efficiency. In addition to the ability to send emails to individuals, the whole team, or your clients, the ClientFlow email platform allows you to set reminders, use an assortment of email templates, and track your email messages to ensure organization and efficiency of your correspondence. Project Management. ClientFlow may not be as sophisticated as some of the other project management software on the market, but it offers several project management tools that bring organization and efficiency to your projects. It’s very straightforward and easy to use. Task comments. With task comments, you can add task specific comments, so team members can easily follow directions every step of the way. Task status. Create task-specific directions such as to do lists, task labels and so much more so team members know exactly what needs to be completed on each specific task. Time tracker. ClientFlow time tracker lets you keep track of every minute each task takes to complete for an overall total of the entire project to aid in efficiency, proper billing, and team member management. Kanban board. The Kanban board allows you to visualize the project’s workflow, giving you a well-coordinated overall picture of the entire project to stay on schedule. Project assignments. Easily assign the workload to your team members for a better division of labour and improved efficiency while being able to view the work in progress in a straightforward area. Developers best friend. Transforming wireframes or storyboards into functional code or creating a website format for a client requires a lot of brainstorming with the team members. With ClientFlow, you can have methodical and coordinated team discussions for maximum team output. ClientFlow project management software is a relatively new suite of project management tools, and creators are continuously adding new and current tools, options and benefits to the suite. Auto-reminders are in the pipeline. As of now, users can send reminders on pending and late approvals with one click. Integration with Gmail and Google groups allows users to read, manage and compose their Gmail/Google group conversations within ClientFlow. Integration between Conversations and Tasks within ClientFlow so that user will be able to create tasks from conversations and have associated conversations of a task within the task itself. Shared Client Communication channel to help users create an email to which they can direct all client related communication. They can then collaborate with teammates and manage client communication from a single channel. Invoicing will allow users to be able to create time-based invoices based on Project, Task or User rates. ClientFlow is an essential project management software; and as an easy-to-use, efficient suite of tools, it surpasses other comparable software when you need your project to remain organized, well-coordinated and within budget. Your team will effortlessly complete the project that can even exceed your clients’ expectations. With the ever-increasing need to stay one step ahead of your competition coupled with the movement of on-demand services and products, businesses need to manage multiple tasks consecutively with a high level of efficiency. Hence, this project management software is still continuing to improve and branch out to add to the already impressive options currently available. ClientFlow has been kind enough to provide our readers with a lifetime 20% discount. 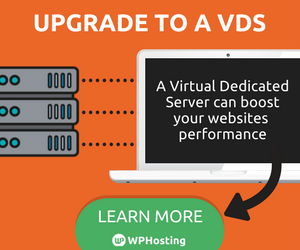 Simply enter the CFWP20 discount code when signing up for the paid plan.